In keeping with my recent interest in bird photography, I have made several trips from our home in Lufkin, TX, to the Gulf Coast. There are birds to be found around here, of course, but nothing like the numbers and variety that exist along the coast. I have found, with the help of others as well as by resting my gluts behind the wheel, quite a few good locations rich in avian subjects. Great Egret with nesting materials at the rookery at Rockport, TX. Favorite spots include the Rockport/Fulton and Port Aransas areas. The rookery located right in town draws birders and photographers from all over the world. Lots of Great Blue Herons, Great Egrets and Night Herons and more nest and raise young there. Closer to home is Galveston with 8 Mile Road, Sportsman Road, Lafitte’s Cove, the Bolivar Ferry being reliable locations. (Of course, I always seem to find good sea-food hot spots on these trips, too!). Least Bittern chick, Anahuac NWR. East of Galveston on Bolivar Peninsular are places like Bolivar Flats and Rollover Pass, but two of the best places I’ve found so far are the Smith Oaks Rookery at High Island and Anahuac NWR. 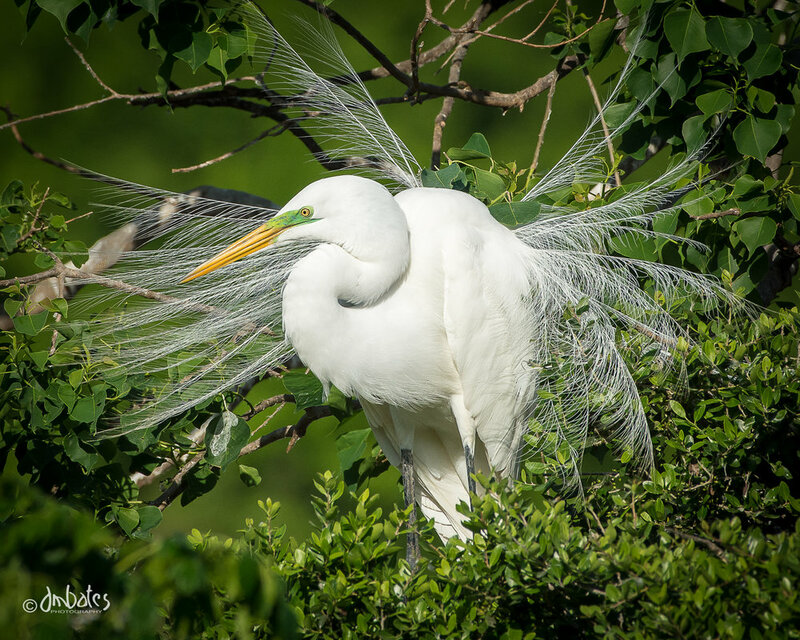 Smith Oaks is an amazing place in the spring, hosting incredible numbers of Great Egrets, Snowy Egrets, Cormorants, Tricolored Herons and more, building nests, laying eggs and raising young in front of several viewing stands. The Anahuac NWR, just a few miles NW of High Island, is host to many species of waterfowl, waders and other marsh-loving birds that are easily seen from a 2 1/2-mile loop around Shoveler Pond. All that’s necessary is to drive slowly with a camera sticking out the window and you’re bound to see some interesting bird activity close enough to photograph with a moderate telephoto lens. Purple Galinule walking on lily pads at Anahuac NWR. When it comes to more local subjects, I have turned part of my back yard into a small haven for song birds by putting up feeders with nearby perches and even keep one or two pop-up blinds set up, allowing me to get close. I’ve only been into this bird thing for about a year and have just scratched the surface. I’m looking forward to visiting places I’ve heard about with good concentrations in such unlikely locales as San Antonio, Dallas and other cities, as well as many more spots along the coast. You can see a lot more bird images in the Galleries portion of this website. So, stay tuned for more updates and keep those shutters clicking. Hi and welcome to my blog! Here I post articles about photo trips, new work, technique, equipment, projects I'm working on - who knows what!